An "obsessed" pensioner who triggered a full-scale terrorist alert when he threatened to blow up the Law Society over a disputed £587.50 solicitor's bill was today jailed for 15 months. Joseph Dowling, 69, a retired property developer, caused "widespread chaos" when he parked his Mercedes van outside the society's headquarters in Chancery Lane claiming to have an explosive device. He refused to leave his vehicle in a 28-hour stand-off with police on 10 January this year. The court heard how Dowling's grievance dated back to 1994 when he was charged by his local firm of solicitors in Broom, Bedfordshire, £587.50 over a preliminary meeting which he had understood would be free. He said he had complained repeatedly to the Law Society and the Bar Council, but without success. 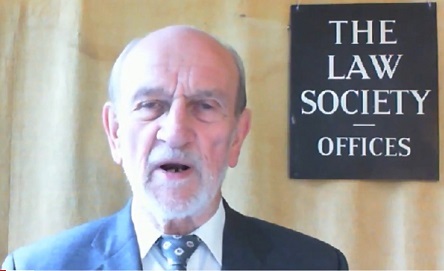 But Dowling, who pleaded guilty at an earlier hearing to a charge of placing an article with intent, has now had his complaint with Leeds Day solicitors resolved after the Law Society had a fresh review of his case and found in his favour. Anthony Pitts, defending Dowling, said his client was now planning to "enjoy the rest of his retirement - his mission is accomplished". Judge George Bathurst-Norman said he had no choice but to impose a custodial sentence. He said: "I credit you as a man of impeccable character, highly regarded by all, and now almost 70 years old. "Having said that you caused fear and anxiety and massive disruption over large areas of London. "Emergency services were on full alert and all police reserves were thrown in. It has to be made clear to you and people like you who may indulge in hoaxes of this kind that even at your age a custodial sentence becomes inevitable." The drama unfolded when a Law Society staff member noticed Dowling's van had been parked outside the building for three hours and on closer inspection saw a poster which stated he would not move until he had seen a solicitor, and that, "If I am forced to move in any way I will set two time switches, one at 10 seconds, one at 15 seconds, and leave the vehicle in haste." At 6.45pm the Law Society called the police and two officers arrived to speak to Dowling who refused to leave the van. Dowling then told a senior officer: "I want to speak to a solicitor from the Law Society and I want some questions answered. I am well prepared and I have my little device here if there are any attempts to remove me." The officer could see Dowling had a small electronic device in his hand which looked like a trigger with wires running into the van. A command team was then called consisting of hundreds of police officers, explosives experts, hostage negotiation teams, firearms officers and a territorial support unit. Fire engines and ambulances were also scrambled. The court heard how buildings were evacuated, a large area surrounding Chancery Lane was cordoned off, and the nearby Royal Courts of Justice had to be closed. Prosecuting, Ben Summers said the situation remained the same until the following evening when he was finally persuaded to give himself up. A search of the van revealed the device was nothing more than a power adaptor for a cigarette lighter made to look like a trigger.